A variety of hydrangeas and one stunning magnolia shine in a Ladue garden. There are two hallmarks that dominate the landscape in this stunning Ladue garden. One is a profusion of hydrangeas that flow along walkways, drift through beds and even climb brick walls. 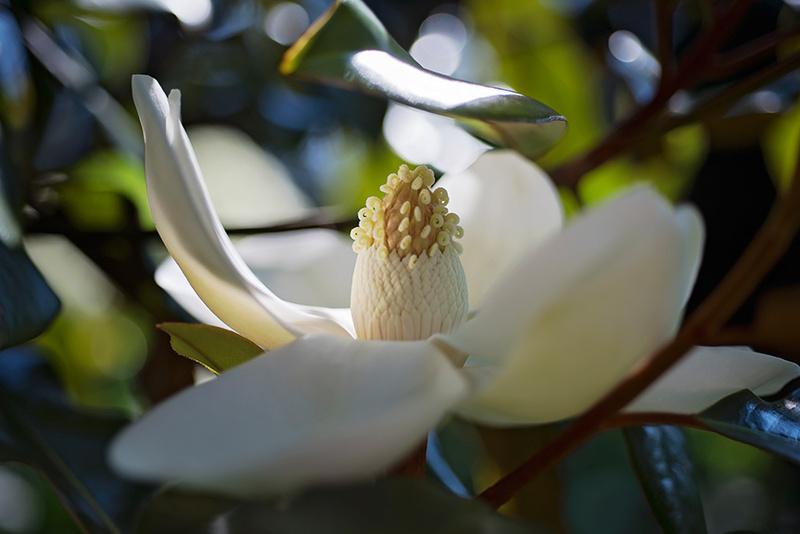 The other is an immense, regal grandiflora magnolia that holds court against the back of the red brick house and makes a sweeping bow across the brick patio to embrace both hard structures and fold them into the beauty of the garden. 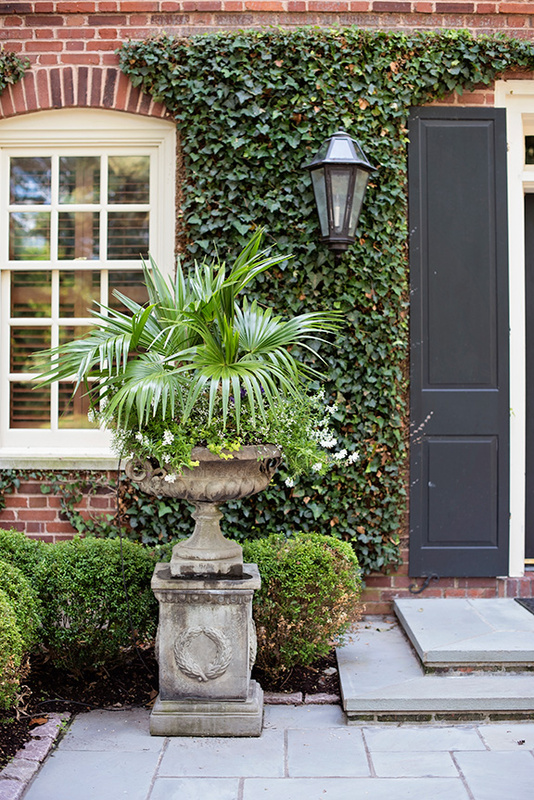 The Georgian-style house, much of the landscaping and the many planters surrounding the home create a classical, formal impression. 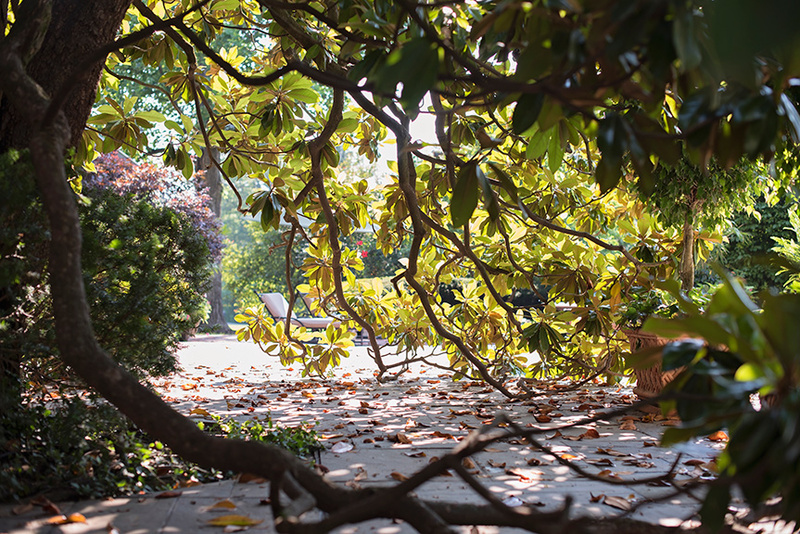 But that is tempered by the softly rounded, nodding hydrangea blossoms and graceful, curving magnolia branches, which project an air of warm, gracious, Southern hospitality. 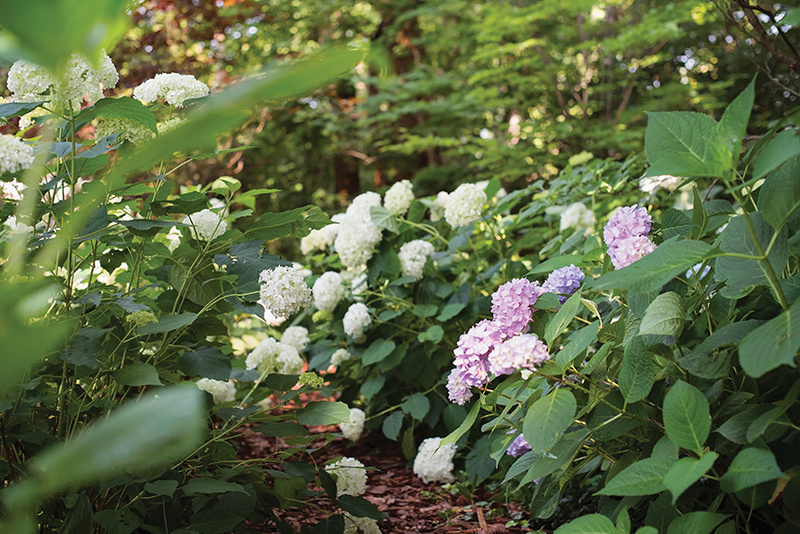 Rand has used a number of different hydrangeas so that one hydrangea or another will be blooming from early summer through fall. Because the blossoms stay on the plant and change color as they age, all have a long season of interest. First to bloom are the "Annabelles" that thrive in a part-shade situation and feature large mops of white flowers that droop on graceful stems. Close on their heels are the oakleaf hydrangeas with conical white blossoms that turn to pink. They will take full sun as well as part sun. In fall, the leaves turn a beautiful mahogany red. Climbing hydrangeas cover the shaded back wall of the brick garage. In the early summer, foliage, that from a distance appears to be dark-green ivy leaves, suddenly glows with hundreds of flat, sparkling-white saucers of tiny blossoms. In the winter, the bare branches create an interesting silhoutte on the flat garage wall. “It is beautiful when the snow falls on it,” Rand says. For color the homeowner and Rand love both "Nikko Blue" and "Endless Summer" hydrangeas. Sought out for its electric color, Nikko Blue can be a bit temperamental as it flowers on old wood. A harsh winter or sudden cold snap in the spring can literally nip it in the bud. Hybridized to bloom on both old and new wood, Endless Summer does not have the brilliant blue color of Nikko Blue, but it will bloom reliably every summer and well into fall. Soil acidity affects the color of both varieties. To ensure the best blue color, Rand increases acidity by treating the earth surrounding the shrubs with aluminum sulfate in early spring. In alkaline soil both varieties will bloom pink. 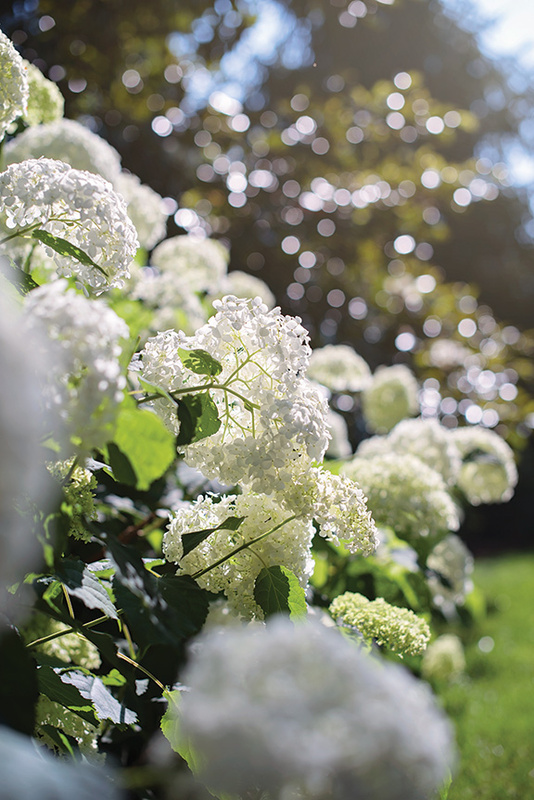 Later in the summer "Tardiva" and "Limelight" hydrangeas shine out. Tardivas often resemble small trees with spears of conical white blossoms shooting outward and upward. Limelights look more like large shrubs with huge, cone-shaped, lime-green blossoms that change to white and then rose. The weight of the flowers often causes the branches to arch. All hydrangeas can be cut as fresh flowers and also dried. Both Tardiva and oakleaf hydrangea blossoms have a light, sweet scent, Rand notes. The homeowner had a house in Naples, FL, as well as St. Louis, and she loves the tropical look of the foliage surrounding her Florida home. In summer, she brings that look to her patio up north. “The patio is the one place we have full sun,” Rand explains. 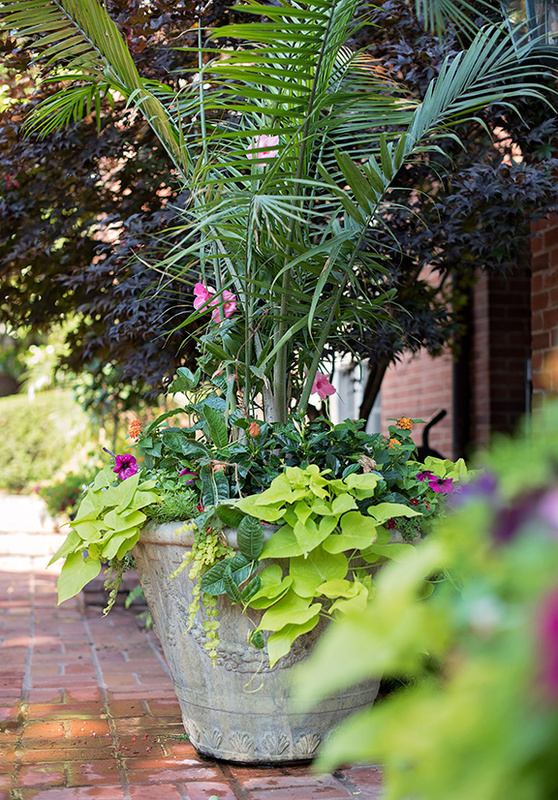 “We put a lot of color in containers and use a lot of tropicals. She loves palms. 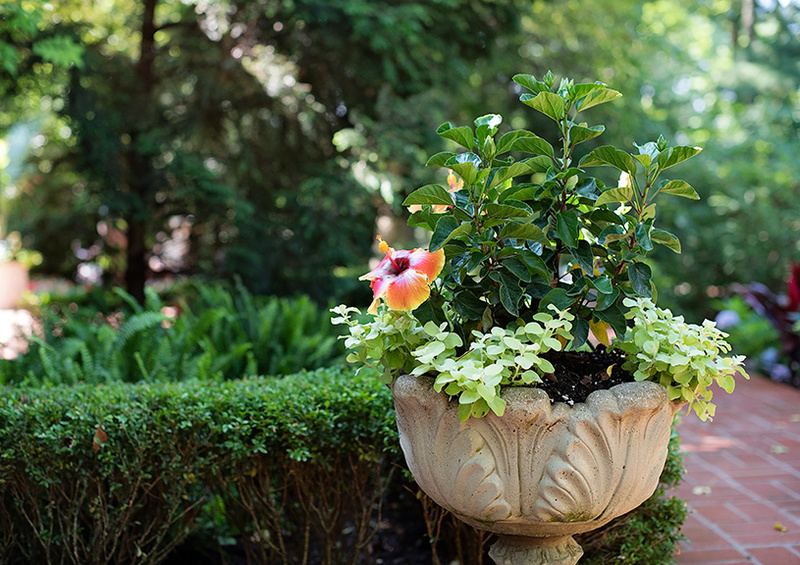 We have bright hibiscus, both in tree form and tucked in with smaller plants. She loves the color of mandevilla vines.” Rand often trains the mandevillas to grow up through the palms. With a great deal of focus on the patio, where the homeowner loves to entertain, Rand changes out many containers four times a year. In fall and winter, the hallmark hydrangeas and magnolias do double duty with dried hydrangeas and magnolia foliage spilling over with seasonal interest. If you have hydrangeas in your own garden and want to bring bouquets of those beautiful flowers indoors, you often can have mixed results with some blossoms holding up well while others wilt within a day or two. — In the garden, cut in the morning and select only the most mature blossoms. Clip the stem on a diagonal and while still in the garden, plunge the stem immediately into a container of tepid water. — Recut stems a second time to the length you want, cutting again on the diagonal and make a second vertical cut up the stem. The shorter the stem, the longer the flower will last. Place the stem for 30 seconds in a container of just boiled water to dissolve sap and allow the blossom to take up the maximum amount of water. — If you have some extra time, you can condition the blossoms by submerging the entire stem to just below the flower head in a container of lukewarm water immediately after you have recut the stems. Then cover the blossoms with a damp paper towel and move them to a cool location for several hours. You can also condition by submerging the entire blossom in a sink or bathtub of cool water for 20 minutes. — When arranging the flowers, adding a floral preservative to the water is always a good idea. Change water and recut stems regularly. — If after all that you still have a wilted blossom or two, try recutting the stems and plunging the entire wilted hydrangea into a sink of cool water for about an hour, making sure the stem is under the surface of the water. That may rehydrate the blossom and allow it to bounce back to its previous beauty.